We are situated only 100 metres from the heart of the city, and the beaches. Our accommodation includes singles, twin, doubles, and dorm style rooms, all of which are clean and comfortable. We have seperate male and female communal bathrooms, laundry facilities, a fully equipped kitchen, dining area, lounge and games room. Our gardens and barbeque area are the perfect place to relax and meet new friends! We offer bike hire, tour and accommodation booking service and information for exploring the nearby forrests, beaches and wineries. 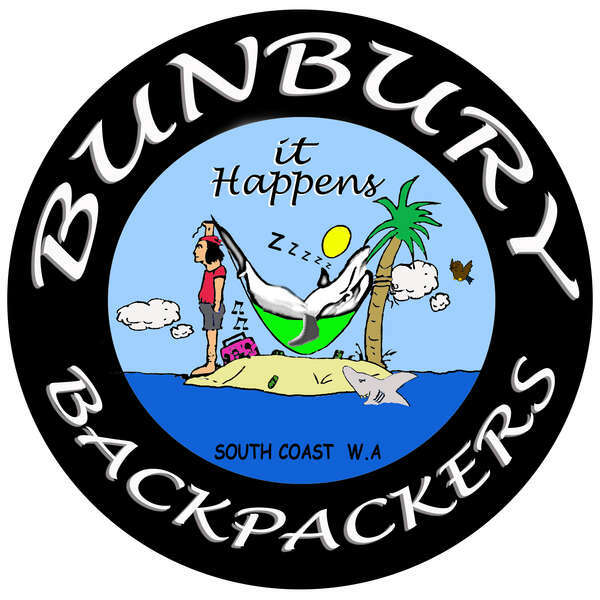 Bunbury is the Gateway to the South West and offers something for everyone. Whether it be getting back to nature and visiting our friendly dolphins, feeding the local kangaroos or taking a walk through the Tuart Forrest or 10,000 year old mangroves. Head to one of our golden sandy beaches where you can try body boarding in the surf at Back Beach or have a more relaxed swim in the calm waters of Koombana Bay. For the more adventurous traveller you can Sea Kayak with the dolphins, explore W.A's newest dive wreck; The Lena or head for the sky by taking the controls and flying a small plane. In the evening visit one of the many restaurants, cafes, bars or one of our three nightclubs to end what would have been a perfect day. How could we forget our free home made cake and coffee every day at 6.30pm when everyone gets together to share stories, have fun and make new friends. We have great weekly rates. Please ask us! If you wish to cancel or change your booking, you must notify us at least 48 hours prior to the day of your booking. If you fail to provide 48 hours notice prior to cancellation, you will be charged for the first night of accommodation you had originally booked. By confirming your reservation at Wander Inn with credit card details, you agree to the above terms of the booking. Once accommodation has been paid for in full on arrival at the hostel it is non refundable. The acceptance of changes to bookings is solely at the discretion of management.